This paper describes the method of onion-like nanoparticles synthesis in a microflow. As the core of a material, platinum nanoparticles were used. The first shell consists of metallic palladium, and the second one is metallic gold, respectively. The synthesis of onion-like nanostructure was performed using microflow reactors system, which consists of 3 independent elements. As the reducing agent of precious metals ions, vitamin C was used. To prevent NPs from the aggregation, a polyvinyl alcohol as the stabilizing agent was applied. 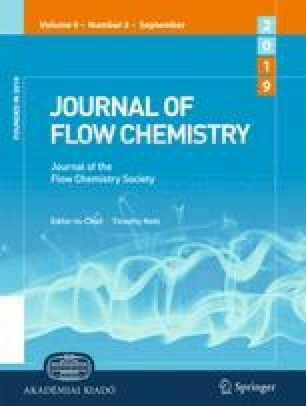 Supplementary material is available for this article at https://doi.org/10.1556/1846.2015.00026 and is accessible for authorized users. Supplementary material, approximately 154 KB.